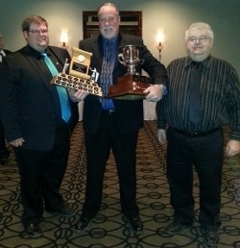 Ed Shafer is the Auctioneers Association of Ontario's 2013 Grand Champion Auctioneer. The Shafer Auction Company has been conducting auction sales of all types since 1991. In addition to his regular Estate/Antique sales, Shafer Auction Company has conducted sales for Government, Business and a wide range of private individuals and charities. Ed Shafer also currently works as a contract auctioneer for LVG Auctions (commercial/industrial equipment) and ADESA (dealer automobile auction). Through these sales, he has gained a wide range of sale and valuation experience, which he can apply to each new clients situation, in order to better satisfy their needs. When The Shafer Auction Team arrives at a sale site, they are prepared to handle all aspects of the organizing and conducting of that auction sale, weather it is a commercial setting, a farm or a private residence. We have the experience to know that each client has their own unique needs and the expertise to fulfill them.